Q31. List the safety precautions that apply to power tools. Q32. List the safety precautions that apply to extension cords. PORTABLE PNEUMATIC POWER TOOLS LEARNING OBJECTIVES: Identify dif- ferent types of portable pneumatic power tools. Describe the uses of different types of portable pneumatic power tools. List the safety precautions that apply to portable pneumatic power tools. Portable pneumatic power tools are tools that look much the same as electric power tools but use the energy of compressed air instead of electricity. Because of the limited outlets for compressed air aboard ship and shore stations, the use of pneumatic power tools is not as widespread as electric tools. Portable pneumatic tools are used most around a shop where compressed air outlets are readily accessible. PNEUMATIC CHIPPING HAMMER The pneumatic chipping hammer (fig. 1-64) consists basically of a steel piston that is reciprocated (moved backward and forward alternately) in a steel barrel by compressed air. On its forward stroke the piston strikes the end of the chisel, which is a sliding fit in a nozzle pressed into the barrel. The rearward stroke is cushioned by compressed air to prevent any metal-to-metal contact. Reciprocation of the piston is automatically controlled by a valve located on the rear end of the barrel. 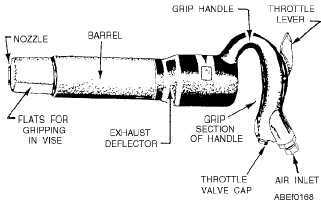 Located on the rear end of the barrel is a grip handle, containing a throttle valve. The pneumatic hammer may be used for beveling; caulking or beading operations; and for drilling in brick, concrete, and other masonry. Chipping hammers should not be operated without safety goggles, and all other persons in the immediate vicinity of the work should wear goggles. While working, never point the chipping hammer in such a direction that other personnel might be struck by an accidentally ejected tool. When chipping alloy steel or doing other heavy work, it is helpful to dip the tool in engine lubricating oil about every 6 inches of the cut and make sure the cutting edge of the tool is sharp and clean. This will allow faster and easier cutting and will reduce the possibility of the tool breaking. When nearing the end of a cut, ease off on the throttle lever to reduce the intensity of the blows. This will avoid any possibility of the chip or tool flying. If for any reason you have to lay the chipping hammer down, always remove the attachment tool from the nozzle. Should the chipping hammer be accidentally started when the tool is free, the blow of the piston will drive the tool out of the nozzle with great force and may damage equipment or injure personnel. ROTARY AND NEEDLE IMPACT SCALERS Rotary and needle scalers (figs. 1-65 and 1-66) are used to remove rust, scale, and old paint from metallic and masonry surfaces. You must be especially careful when using these tools since they will "chew" up anything in their path. Avoid getting the power line or any part of your body in their way. The rotary scaling and chipping tool, sometimes called a "jitterbug," has a bundle of cutters or chippers for scaling or chipping (fig. 1-65). In use, the tool is pushed along the surface to be scaled, and the rotating chippers do the work. Replacement bundles of cutters are available when the old ones are worn. 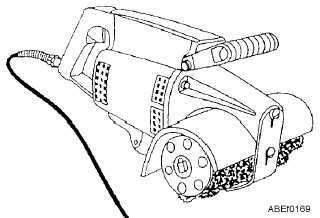 1-40 Figure 1-64.Pneumatic chipping hammer. Figure 1-65.Rotary impact scaler.